Firsts are always special, and homeowner Brittani Allen notes joyfully that she and her husband, Jeff, are celebrating a milestone of their own. 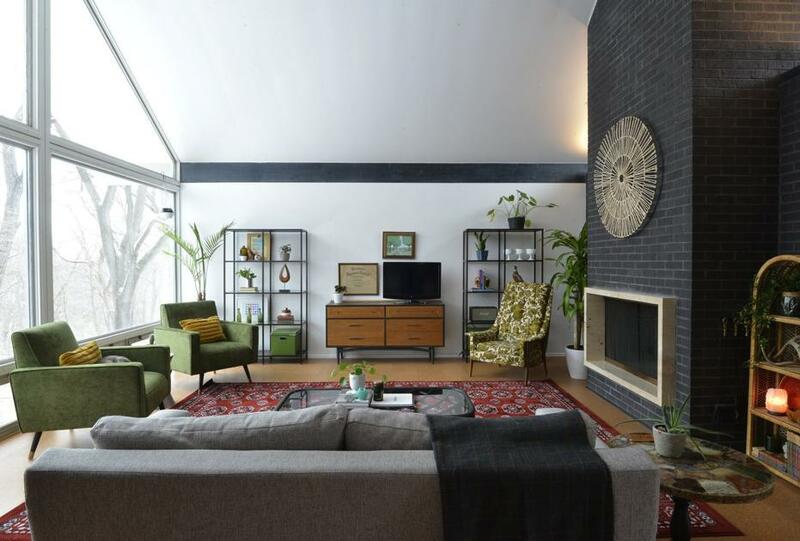 The midcentury modern home they bought last January was designed by celebrated architect Charles Erwin King and came with a set of original blueprints, now framed and proudly displayed. It was built in 1962 for a prominent doctor and his family. The single-story home nestles into woods in west Belleville. King began a 14-year architectural practice in Belleville in 1947 and later relocated to St. Louis. He practiced around the country, earning many honors and awards. In 1991 he was named one of the “The Top 100 Architects in America” by Architectural Digest. King died in St. Louis in 1993. He is most associated with the popular design style known today as midcentury modern, which generally developed from 1935 to 1965; it emphasizes open floor plans and ample windows, opening up interior spaces and giving a sense of living in nature. In 2016 the Belleville Historical Society founded the Mid-Century Modern Architecture Museum in a King-designed home, not far from the Allen home and eight other King designs. The organization continues to identify residential, commercial and public buildings and additions that King designed. The exterior is a contrast between graphite-colored brick and white stucco, with a bright yellow door. The main floor is 2,100 feet square feet and encompasses three bedrooms, a full and a ¾ bath. There’s also a screened porch and a deck. The full finished basement has another half-bath. Although the couple had renovated and flipped a small house in Belleville, they welcomed their parents’ experience and knowledge on this larger project. “Fortunately, we have family in Illinois who know what they are doing,” she says. “We’ve done an update, more cosmetic than structural. Our goal is cozy but with clean lines.“ In just their first year the couple had all carpet replaced with cork tiles for a neutral, natural base. After they removed wallpaper, she learned to plaster when some of it adhered to the old grasscloth coverings. Then she painted walls white for uniformity. “I wanted to create a canvas that we could work against, to hang artwork and to change and update it.” The striking exception is a show-stopping blue wall behind the master bed. She responds, “Jeff’s my filter; he has more say in decorating than he thinks he does.” Cherished furnishings and photos from both families lend a blended feel. Green plants, family mementos and unique wall décor reflect the owners’ personalities. Wide and welcoming, the entry ushers visitors into a semi-open living and dining area that is bathed in light and views. The ceiling peaks at 15 feet in the middle; dark wood beams punctuate the soaring space. The free-standing brick fireplace on one side of the room allows more natural light in and a wall of glass on the other side overlooks deep woods, creating a serene nest. Ages • Brittani is 29; Jeff is 33; They have been married eight years. Occupations • She teaches English language at Woerner Elementary School in St. Louis. He produces video and music for the Gathering church, St. Louis. In 2000, previous owners transformed a larger family room into a new eat-in kitchen with style and function. The Allens also use the adjoining screened porch for seasonal dining. One quirky element of the home is a small linear space just left of the entry, once the original galley kitchen. When previous owners remodeled the home in 2000, they added custom built-in wood shelves to the galley area but moved and enlarged the rest of the kitchen into the family room. Jeff Allen dubs the galley “the Pyrex viewing room” because the couple added seating and now display his wife’s colorful collection of Pyrex glass cook and bakeware there.